There is nothing quite like receiving a fresh Flower Bouquet! 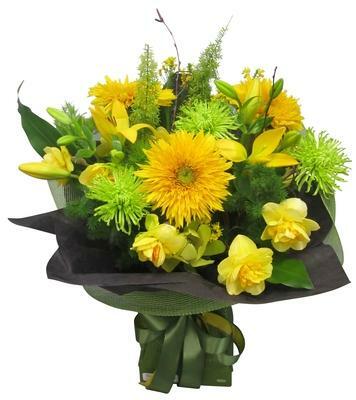 An artfully created hand-tied mixture of flowers, which are beautifully presented and delivered in a water-filled vox, to ensure long-lasting freshness and delivered in Auckland by our Professional Floral Couriers. What is a Vox Flower Bouquet? What is a Vox? Not a Vase - not a box - It's a Vox. This clever water transport system for flowers was invented by a local West Auckland Florist, also a close friend of Best Blooms - Created by Daphne Studio of Design. We are strong advocates and proud supporters of delivering our flowers in water, as we 100% know it will ensure your flowers will arrive fresher, and last longer, as well as being beautifully presented. Your Flower Bouquet can be left in the vox or can be easily transferred to the recipients own vase to enjoy in the home. They are perfect for Sympathy flower bouquets as it makes things so much easier and simpler for the grieving family. Send a Bouquet of Fresh Flowers Today. For same day Auckland delivery of your bouquet - Our website cut off time is 12 noon for business deliveries and 1.45pm for Home address deliveries in Auckland. If you have missed the cut off time then please do call our florists on 09 838 9058 and we can give you todays courier timings. We have had many, many customers email and phone us to comment on our fresh and long lasting flowers. Please trust us to send your flower bouquet to someone special today.